Call it 670 miles or perhaps more precisely 674 miles, but either way, the Yellowstone River remains the nation's longest undammed waterway. It’s a great river that gathers some of the finest mountain and prairie topography on the planet as it passes peaks reaching 12,000 feet in elevation, the largest high-mountain lake on the continent, dense evergreen forests, buttes, colorful badlands, deep canyons and sweet-smelling sage and juniper covered hills. A good portion of this wondrous river flows in Wyoming, but Montana claims most of it and gives it a home. Another suggestion is that the French name was a literal translation of a Minnetaree Indian expression that possibly referred to the yellowish sandstone bluffs that are prominent along many parts of the river. The Crow Nation called Yellowstone the Elk River because it was a migration route for the elk moving from summer range, high up in present-day Yellowstone Park to their winter habitat along the river’s reaches out on the Montana prairie. 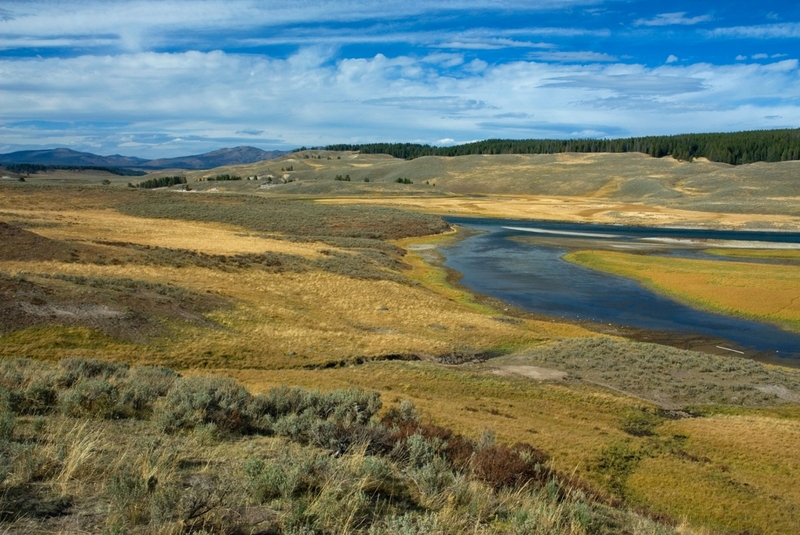 When President Grant designated Yellowstone National Park on March 1, 1872, the act referred to “a track of land in the territories of Montana and Wyoming, lying near the headwaters of the Yellowstone River.” It was only later that discussions between the secretary of the interior and the superintendent of the park finally lead to the name place being called Yellowstone National Park. Let’s switch years and talk about Hellgate Canyon near Missoula. Today, many people passing through this Missoula gap take the name for granted. At one time, it was quite a different place. French-Canadian trappers and missionaries (take your choice depending on which legends you read) have it that the mountain Indians, especially the Flathead (that's what Lewis and Clark called them, although they were actually the Salish), traveled through the canyon in pursuit of bison out on the prairies beyond the mountain front. The Blackfeet, who lived on the prairie side, were jealous of those trying to hunt on their lands and attacked them. Many times, the Blackfeet ventured into the mountains and ambushed the western tribes as they came through the canyon. The gruesome evidence of these raids was the "Gates of Hell." Hell Gate also was the original name for Missoula. In 1860, entrepreneurs Higgins and Warden established a trading post at the confluence of the Bitterroot and Clark Fork rivers. Later, the town site was moved closer to Hellgate Canyon at the confluence of Rattlesnake Creek and the Clark Fork River and renamed Missoula. Today, cold Hellgate winds can traverse the canyon in winter. Brought about when deep, cold arctic highs flood the eastern prairies, the winds seep into the Clark Fork River canyon, where the constricting canyon walls force them to pick up speed before exploding into the unsuspecting and usually gentle Missoula Valley. Many a University of Montana student walking to classes will attest to their low wind-chill temperatures.